I enjoy updates -- so keep sending them! too. She is so sweet and incredibly lovely. She is doing SO well I'm waiting for a crazy dog to bust out:) she took well to her crate. Only whined a little bit when going to bed and no accidents yet! So thank you for such a wonderful little puppy. She has been a blessing thus far. Now cross your fingers and knock on wood so I don't jinx myself!! We are doing extremely well with our puppy! I named him Boris. He did good on the ride home. When we first starting driving, he began to whine a bit. We did everything we could to comfort him but nothing seemed to work until we turned the radio on. As soon as he heard the music, he settled right down and fell asleep. We stopped twice to potty (he went the second time but not the first). His kennel is in my bedroom so that I can hear him at night. That evening he cried and whined for about 15 minutes before watching a little t.v. (seriously, he watches t.v.!) and falling asleep. He had one accident in the house that night (completely my fault! I didn't take him out before going to bed so he peed on my bedroom floor. Still not thinking, I just put him in his kennel until the next potty time. When I went to take him out, he had already peed in his sleep.) and hasn't had one since. I have been working with him on potty training since we got home. I take him out every 2-3 hours, all day and night. Now, he let's us know when he needs to go out. I also have a potty training bell but it is a bit too far for him to get to with a full bladder. Tomorrow, we plan to leave him alone for the first time. He does very well by himself with someone in another part of the house. Boris went to the vet on Monday and he said he looked great. All the people in the office were smitten by him! While waiting to see the vet, another dog was barking and acting up a bit. So, while sitting in my lap, Boris gave him a couple barks! He was so cool about it, he just lifted his head and "bark-bark" then watched the dog pass by. Of course, everyone thought this was hilarious since the naughty dog was about 3 times his size! I can not thank you enough for this precious gift. He is an absolute doll and we love him so much. He is learning very quickly and I can't imagine life without him. With the cold weather approaching, my mom bought him a winter coat. He can not sit still long enough for us to take pics but when we do I will send them to you. His favorite toys are the squeaky muffin you gave us and a little squeaky Lamp Chops. Here he is with Lamp Chops. PS: The Kohns have placed a second deposit with me for a Liver or Liver/Tan from my 2014 litter. I am thrilled that they are so happy with Beau and with me as a breeder -- to come back for another puppy. then was silent. We got up about 3:30 am and she pottied outside and then back to bed till about 8! I need some reassurance . . . it's not cruel to let her cry at night is it? 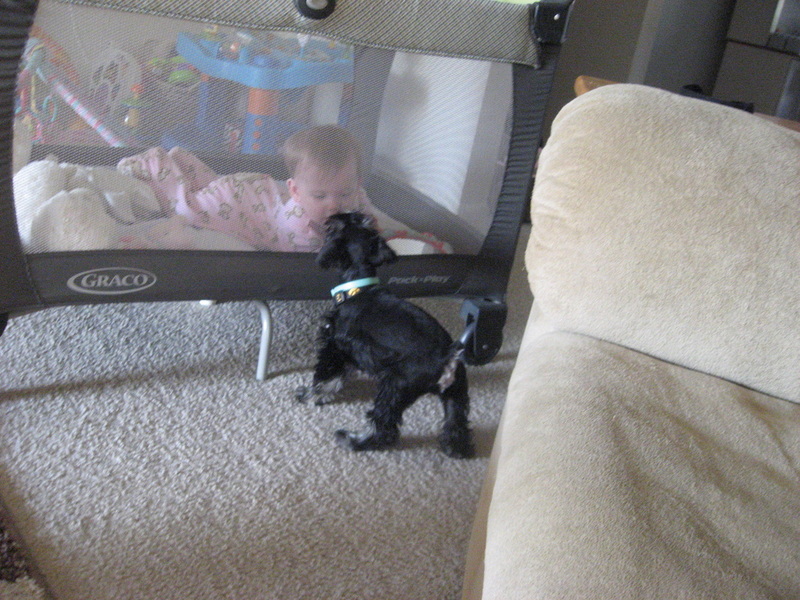 (I told her no it is not and that the puppy will adjust) She sleeps in her carrier in my bedroom and she is able to see me . . . .Also I firmly tell her to "shhhh" (I agree with this too -- great training right off). She was exposed to a 3 year old and 4 month old today. Was great around both of them! I hope the other new families are as happy with their puppies as I am with Gabby! UPDATED: EMAIL DECEMBER, 2013 -- Hi Daphne! I hope you had a wonderful Christmas and are surviving the weather! for that! She's the child I never had! Having said that I hope Teri is doing okay! Unfortunately for her she missed out on a marvelous dog. I hope she can acquire another one sometime soon. soul was evident. My favorite pet before Gabby was a cat named Mystery. 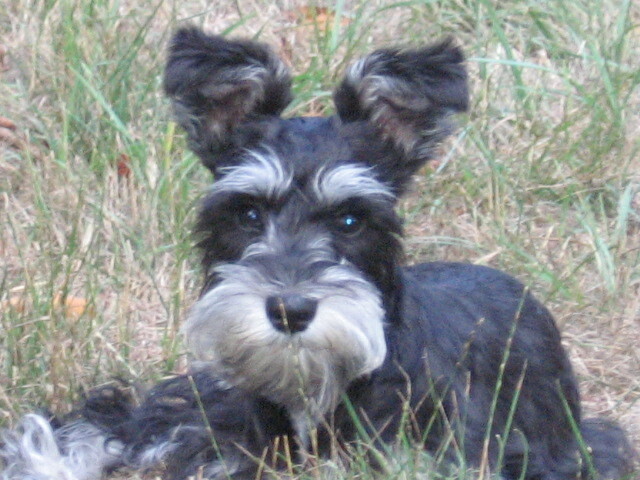 When I lost her in 2001 (she was almost 16) I thought I was going to need grief counseling. The pain of losing her was almost unbearable. I dearly love her still. I hope 2013 is good and prosperous year for you and your family! Did you start a facebook page for the families of your puppies? If so, I think I'll break down and finally join facebook. I would LOVE to know how Gabby's siblings are doing! We are so in love! It feels like we have had him forever - he fits in with our family so perfectly. He is so sweet and loving and follows Tiffany around like a shadow - it is so cute. She told me - "I love my family - mommy, daddy and My brother Brody". Haha! My sisters have come over and one is talking about getting a schnauzer now. Steve adores him and today I put a Dallas Cowboys bandana and he beamed "that's my boy!". He said our family feels complete. Brody loves being with us so I put him next to me in his crate and he does great. Potty training is coming along well - a few accidents but I just follow the guidelines about positive reinforcement. I bought the spray you suggested off Amazon and it's wonderful. He goes to the vet tomorrow. I've been making sure to put him around lots of noises and sounds and he loves playing outside with Tiffany. I haven't taken him anywhere for his protection but I did go to lunch today for two hours and it was so hard! I felt weird like I was leaving my baby! Bottom line - We are so grateful for you! He has brought us so much joy after a really hard year! 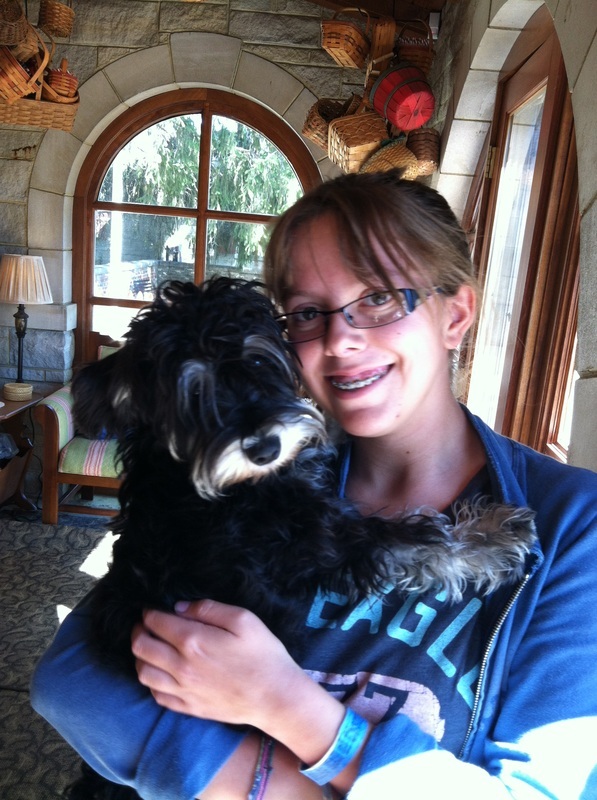 Carissa is in love with Bentley and says he is great with potty training and he is very mellow. The first 24 yrs. went by pretty well. Gracie went with me to Starbucks for coffee this morning and has had so many visitors. Below is an updated picture of Gracie. We are having a really great time getting acquainted, playing etc. Ozzy is a total joy. We are going to the vet tomorrow morning for our check up and then I will get him scheduled for 10 week shots. I can never thank you enough for our little gentleman-he has already brought a lot of joy and love to our home. 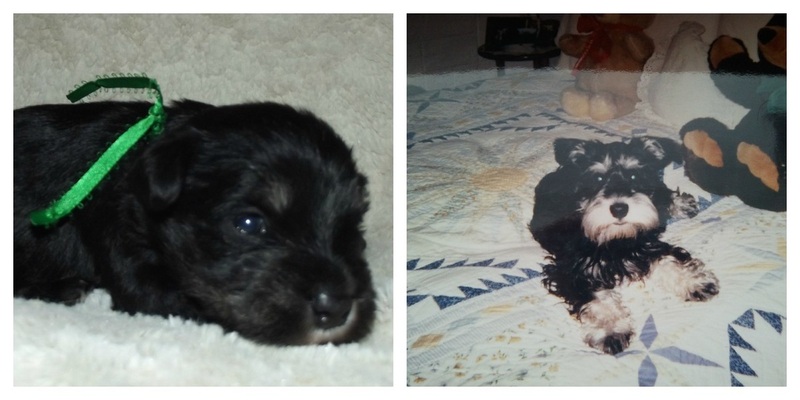 God bless you and yours-Cheryl G.
Below -- Ozzy at three weeks and 9 months... look how bright he is now... beautiful! It has been a wonderful day. The boys said this is the best present ever. Tinkerbell is such a good little girl! You really gave her a wonderful start! She didn't whine at all on the way home. We stopped for a potty break and she went right away. She had her dinner a little after 4 and we tried to take her out to potty before the rain hit but she she wasn't ready. After the rain stopped we tried again and she went within a couple mins. I think she is going to be a quick pottier! My husband thinks she is adorable! Because she is! She was wore out so she is in her bed taking a nap. She loves it when I get on the floor with her and rub her belly. Olga (not holding her pup) and Missy. With her friend Marilyn who is holding Missy (deposit on future litter). Olga gave me a beautiful card and brought me Irish Soda Bread on the day of the pick up! I just adore these two ladies and I can't wait to get Marilyn her puppy too!! best dog ever. She knows a few words like sit, come, up, and lol no! I am so glad I've taken this week off work to help her adjust. It's totally paying off. She had her puppy check up yesterday. I know you hear this all the time but the vet was amazed at how she looked and behaved. She said we had a Great breeder. I said I know! She is healthy and worm free. Sophie. She is doing great. Her adjustment has taken almost no time at all, and that has helped our adjustment! She has slept through the night both nights so far, however she has been an early riser (5-5:15). That is OK as most days we are, too. Sophie has had no potty accidents in the house....zero, none, nada. we are very thankful for the training you did during the first 8 weeks. She loves to play, giving all her toys (and a few area rugs) a workout. Her favorite by far, is the small tennis ball you sent with her. She likes to escape and rest in her crate, and seems to know that it is a safe spot. and she seems to love us back. day. When she is tired (or hiding from the vacuum), she will retreat to the crate on her own. Sophie has gotten very comfortable, has walked short distances on a leash, and has thoroughly entertained us with her antics and personality. As you predicted, she has been a cuddler. We could not be happier, but would like the heat to let up so Sophie can spend more time outside. Take care, Dennis and Gayle (and Sophie!) 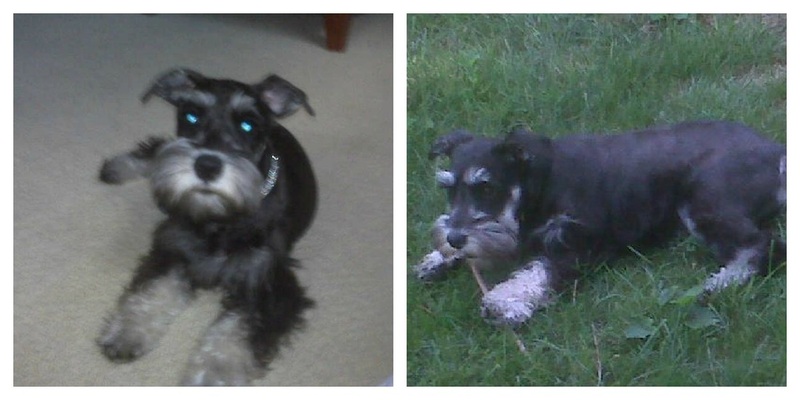 SOPHIE IS GROWING UP -- PICTURED BELOW!!! in their big yard! She and Zoe are such good buddies. Right now, Zoe is recovering from surgery on her left "shoulder". She has a four-inch suture that is exposed and she has to have minimal activity for six weeks. Try getting a puppy to understand that one! It's been really tough and it's only been a week! Maddie wants to play and Zoe tries to on her three good legs, but she really shouldn't. I will definitely give Maddie some kisses for you! Take care and have a great upcoming holiday! Via Facebook Post from Ellie: Just wanted to let you know that Boo is sound asleep. Once we got home we took her out back to pee and brought her in and she played with her new toys. She started walking around checking everything out in the house, back outside and did her business -- now she is sound asleep. Thanks for taking such good care of her for us! Two weeks later: I've been meaning to email you and let you know that Boo is doing great. Dann and I are in love; puppy love that is! We took Boo to the vet for her shots.... etc. She goes back June 7th for her follow up shots. Our vets (2) examined her and we’re very pleased with her attitude, intelligence and looks! The techs loved her and the groomer was impressed with her looks! The vets were impressed that you took the puppies to your vet for their shots etc...; I guess they have a lot of breeders that apparently go to farming supplies store and buy the vaccinations and administer the vaccines themselves. Our vets don't consider a puppy vaccinated if this is the case - because they have no idea if the vaccines were handled properly at the store and through shipping. If they aren't handled correctly then that makes the vaccines ineffective. 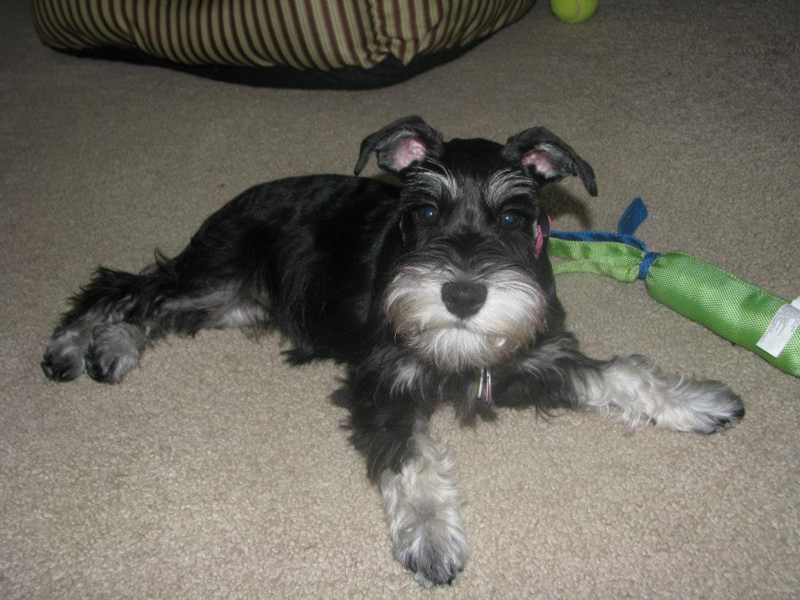 Dann & I couldn't be happier with Boo, she has the schnauzer confidence and curiosity and boy is she tenacious in her play! And we love it that she is such a cuddle bug! We have been letting her sleep with us and so she cries when we have had to put her in her crate when we have to leave (which isn't often due to Dann being retired). We have been working on putting her in the crate for short periods of time while we are home (we don't want her to develop separation anxiety). One of the techs at our vet is starting a puppy socialization class and we will be taking her to that and then to obedience training in a few months. We love Otto! We had a wonderful drive back. He was such a good boy. He adjusted well when we got home, and was happy to meet the family and friends that came to visit, and there were quite a few! He did sleep with me, and slept from 9:15 am until 5 pm and then went back to bed (after a potty break) until 6:30 am. My nice and nephew are having a ball with him and are over visiting every free moment they have. We took him to my nephew's lacrosse game on Sunday, and he was the hit of the side lines. Everybody, I mean everybody wanted to pet him. He was a magnet to the little girls, who thoroughly wore him out. I took him to the vet today and again he was sought after. There faces are just soooo cute, and not something you see every day. My vet fell in love and so did all the nurses at his office. 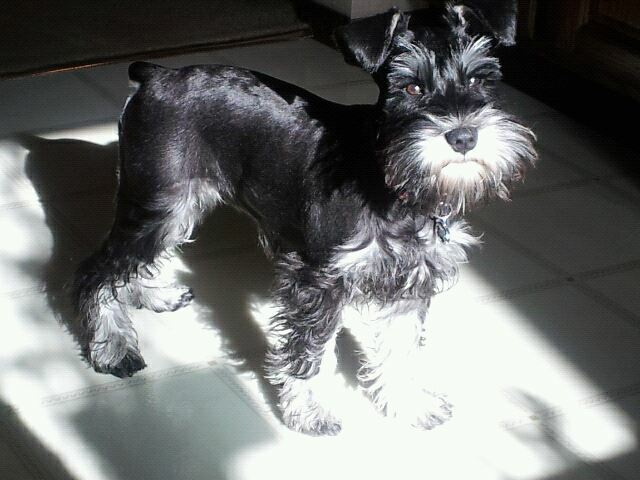 I have given him your name in case someone asks him about schnauzers. I have hung a bell at the door he is to go out, and have been working with him on hitting it. Today, he "rang" the bell to go out and go potty! I was so excited and surprised. But then later, he peed on the floor! He really is a bundle of joy. Thank you again for letting us have one of your wonderful dogs. I know he will bless my family's and my life over and over again. It was a pleasure meeting you and your lovely children. I still can't get over ALL your wonderful dogs. 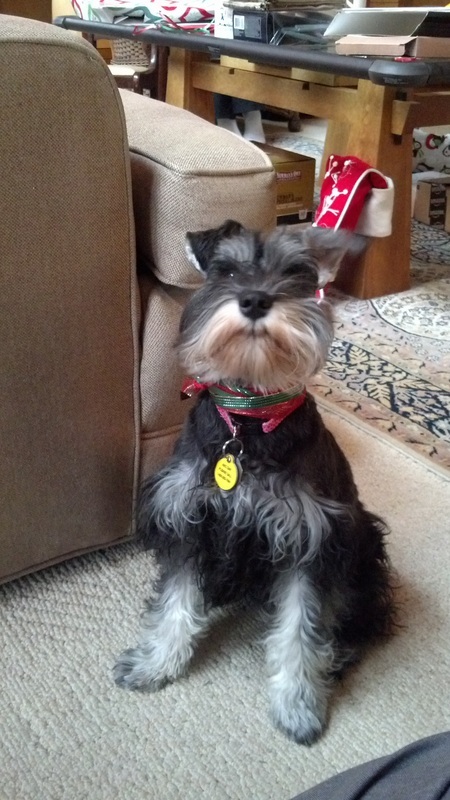 Every schnauzer was sweet and the older dogs were charming. I never did figure out what the white one was. I will forward a few pictures. Oh and by the way, everyone loves Otto's hair cut. It really does make him extra cute. just "so chill" as the boys would say. He is having a great time with his cousin dogs and his favorite is Beau, a 6 year old Bichon. He will be seeing Eliie this week who is a 2 year old golden doodle. He will be spending the fourth with Dieder, a 1 year old wired hair dachshund This week he learned how to climb stairs. Now it is his favorite game. Today he managed to escape upstairs and we didn't realize it. He had a great time with my daughters clothes! Thank you again for letting Otto become part of our family. The Finkels picked up their puppies at 10 weeks old because it worked better for Louie and Edie to have their new family home with them for the summer vacation. I can't wait to hear from the Finkels in the coming weeks! Edie is a Black and Silver and Louie is a Liver aka Chocolate. LOUIE AND EDIE ARE NOW TEENAGERS!